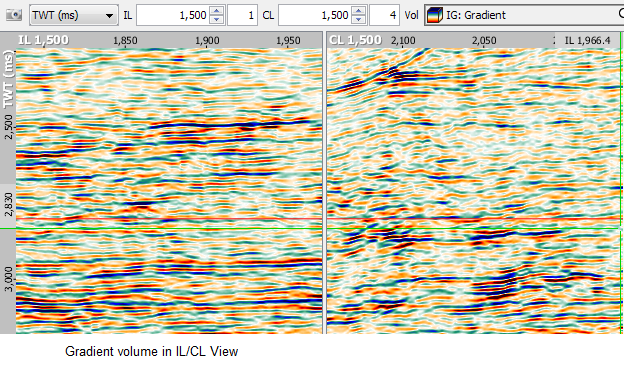 Description Calculates Intercept and Gradient volumes from flattened gathers or multiple stacks to evaluate AVA or AVO characteristics for seismic data. 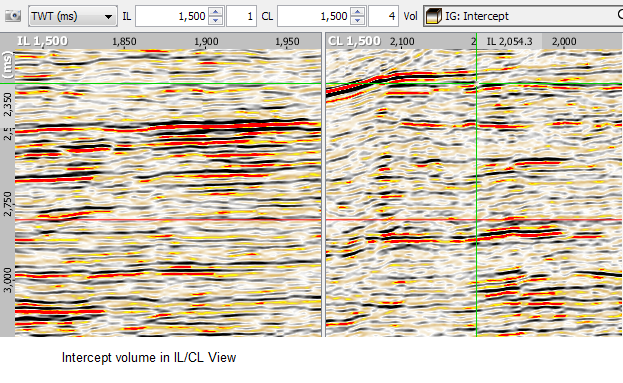 The Intercept and Gradient process can be used to evaluate "Amplitude vs Angle" (AVA) or "Amplitude vs Offset" (AVO) characteristics for seismic data. This process calculates two volumes, Intercept and Gradient, from flattened gathers or multiple stacks and a third volume showing Goodness of Fit. At each sample, the process calculates the linear regression of the amplitudes using Ordinary Least Squares and returns the intercept, slope and optionally R2 (as goodness of fit). The intercept and slope of the regression line are analogous to the first two terms, "intercept" R(0) and "gradient" G, in the two-term Shuey Approximation of the Zoeppritz Equation. Use flat gathers with minimal residual moveout. 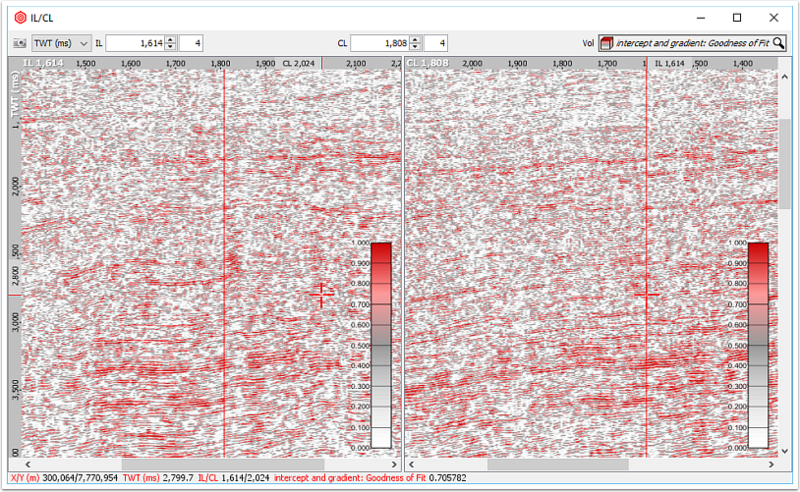 Use amplitude and frequency balanced seismic data. Apply an angle mute to limit the input to below 35–40°. AVO curvature is not accounted for or estimated using this process. This process also supports 2D gathers. Note: If you modify one of the input mutes on the gather volume in the process, the output volume will be recalculated on the fly. Intercept gradient stacks are calculated from the optionally muted input gather. If an offset gather is supplied, the regression will be performed in the AVO domain, unless a velocity is also supplied to convert offsets to angles. 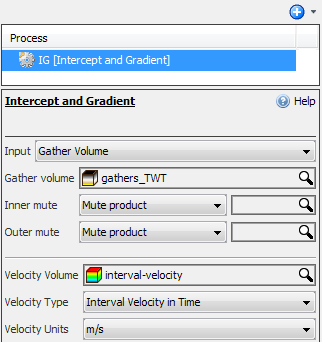 In the Details Panel at Input, select Gather Volume to calculate intercept/gradient from a gather volume. Select the gather volume to be used in the process at Gather Volume. If you have defined mutes, you can select the inner and outer mutes at Inner Mute and Outer Mute, respectively, to use these mutes in the process (see Manually Picking a Mute and Creating an Angle Mute). You can also choose to define an angle to be used in place of the mutes by selecting Constant angle (degrees). If you have supplied an offset gather, select a Velocity Volume to convert the offsets to angles. In the following boxes, select the Velocity Type and Units of the velocity volume you have selected. Tip: To quickly open the output volume, right-click the process item in the Process tab and click Open Child Volume. Vice versa, you can also open the process from the Volume tab directly. To do this, right-click the volume which was created from a process (indicated in italics) and click Open Parent Process. A series of angle stacks are supplied, together with their corresponding angles. A regression of amplitude vs angle is performed. In the Details Panel at Input, select Angle Stacks to calculate intercept/gradient from angle stacks. Click the Add Row icon to add and select an input stack for the process in the Stack column. Repeat this to add multiple input stacks. 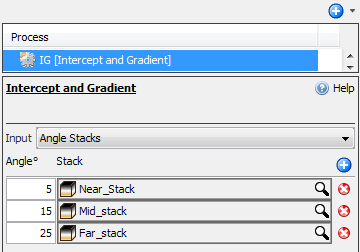 You need to select at least two input stacks from the same survey to generate the intercept/gradient volumes. In the Angle column, type the angle for the corresponding stacks, with acceptable values of between 0 and 90 degrees. The Goodness of Fit volume represents the R-squared value calculated by linear regression through data points. Similar to the R-squared value calculated by a linear regression line in Excel. A value of 1 = more correlation, and a value of 0 = no correlation.